Solar Hearts plays original Positive New Folk, with flavors of Rock, Soul, and Americana. 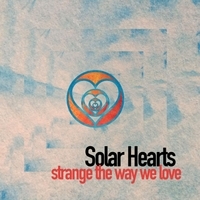 The new EP, 'Strange The Way We Love' is an uplifting call to Love and Life. DISCS AND DOWNLOADS ARE NOW AVAILABLE FOR PURCHASE HERE! Fun and colorful new lyric videos for The Celebration Song and Southern Beauty can be seen below. Enjoy!!! Free downloads, updates on live shows, and new releases. Buy Solar Hearts new EP here!